The 13th annual Stonewall Black and White Compass ball will be honoring 45 years of LGBT accomplishments of the LBGT rights movement on Saturday June 28at the Harriet Himmel at CityPlace, in the heart of downtown West Palm Beach. Mix, mingle, and dance the night away at Compass’ 5th Annual White Party! For the tenth year in a row Compass, Palm Beach County’s LGBT community center, received Accreditation for Excellence in Nonprofit Management. Compass will be teaming up with Poverello, a nonprofit food pantry for those living with chronic illnesses in South Florida, this Saturday to show people that eating healthy can be inexpensive. Compass spent most of 2017 celebrating Tony Plakas’ 20 years with the organization. In January of 2018 he was gone – with no fan fare, no passing of the baton, not even a press release. It even took Compass weeks to update their website to reflect his departure. On Dec. 1 the Compass Community Center showcased one of the biggest pieces of folk art in the world. 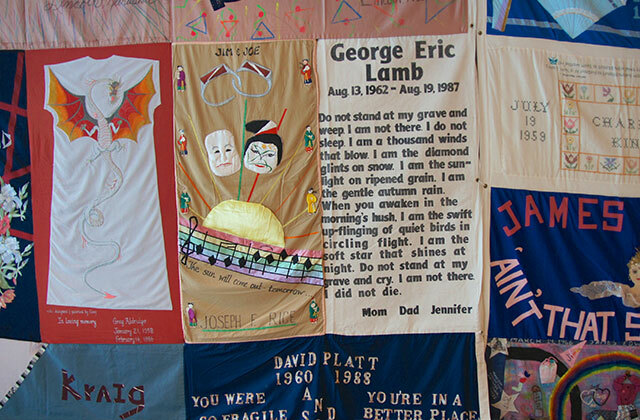 The quilt, which was provided by The Names Project, was used in conjunction with World Aids Day. Even though the program started at 7, there was hardly a shortage of people at 6. Over 80 people showed their support, many of them came sporting their traditional red ribbon. LGBT youth deserve to celebrate their prom just like anybody else. Thursday, Dec. 1 is World AIDS Day, and Compass, the LGBT community center of Palm Beach County, is getting ready to unveil their annual portion of the AIDS Memorial Quilt — which, at 126 panels, makes it the largest section of the Memorial Quilt in Florida. Summer is slowly winding down, which means it’s time for football and the hustle and bustle of the holidays. Before we say goodbye to the warm weather, Compass Entourage has decided to throw their fourth annual White Party on Sept. 30. The month of December is associated with the color red for several reasons. One reason is the holiday season; another reason is the celebration of World Aids Day. Compass will observe this year's annual Transgender Day of Remembrance with an open mic event--to be hosted by Sabrine Pearson and Velvet Lenore, on November 20, at 6 p.m. This year’s Lake Worth Street Painting Festival featured dozens of local artists hunched over in the Florida sun perfecting their chalk renditions of actors, animals, landscapes, and more. No decision has been made on who will fill the spot of Tony Plakas, the former CEO of Compass. This year’s White Party for Compass, held at Penny’s the Duke in Lantana, raised $1,500 for the LGBT community center’s Smart Ride team. "This was my first White Party, and I'll never forget it. The drag performances were full of energy and flair, and raising money for a good cause like the Smart Ride was an amazing feeling,” said Laura Diaz, a social work student at FAU who is interning with the Compass youth department. The Smart Ride is an annual two-day 165-mile bicycle ride from Miami to Key West that raises money for HIV related charities. This year’s event takes place Nov. 15-16. Last year’s bike ride had to be rescheduled due to Hurricane Irma. It ended up taking place Jan. 19-20 of this year, raising $840,245. In total the organization has raised $9.3 million. Visit TheSmartRide.org for more information. 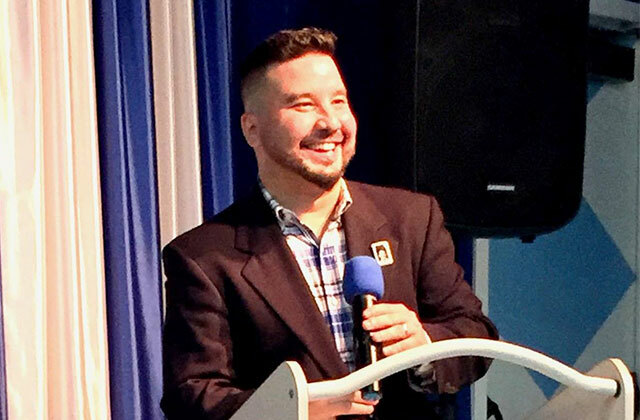 In 2017 Tony Plakas won an international award from the Harvey Milk Foundation and celebrated 20 years with Compass, the community center he helped build. He also had to be resuscitated after having a seizure in February. These were the highs and lows of Plakas’ final year at an organization he has been credited with saving, not once, but twice from certain failure. Compass hosted its seventh annual Gay Chili Cookoff on Sunday. Like last year, the cookoff was held at Penny’s at the Duke in Lantana. The event featured entertainers, giveaways, and ten heaping plates of chili. A lack of bisexual visibility is a common complaint from bisexual organizations and activists. Just including the B in LGBT isn’t enough. Bisexual programs need to stand on their own to increase awareness and visibility. BOISE, Idaho (AP) — A special state fund created to help Idaho navigate state sovereignty conflicts with the federal government has paid out more than $2.1 million over the last two decades, nearly all of it spent on losing legal battles. Julie Seaver has been named Compass’ new executive director.